Flourless oatmeal cookies which taste like carrot cake and are secretly healthy! Thick, soft and chewy cookies made with no butter and no flour, this easy cookie recipe is vegan and gluten-free. Flourless oatmeal cookies are a quick and easy snack or dessert made with rolled oats, peanut butter, and mashed banana. With added shredded carrots, spices and raisins, it’s like enjoying a slice of carrot cake, in cookie form! It’s no secret we are huge fans of carrot cake here! We’ve had a carrot cake baked oatmeal, easy vegan and gluten free carrot cake, and a delicious carrot cake smoothie. It’s time for cookies to get this treatment too! You only need 7 ingredients to make these easy oatmeal cookies. Step 1: Preheat the oven to 190C/350F. Line a cookie sheet or baking tray with parchment paper and set aside. Step 2: In a large mixing bowl, combine your rolled oats, cinnamon, peanut butter, banana and mix well. Fold in your shredded carrots, dried fruit/nuts of choice. Mix until fully incorporated. Step 3: Using your hands, form 8 large balls of dough. Place the balls of cookie dough on the lined tray. Press each ball into a cookie shape and bake for 12-15 minutes, or until edges start to go golden brown. Step 4: Remove from the oven and allow to cool on the pan for 10 minutes, before transferring to a wire rack to cool completely. Step 5: Once cookies have cooled, drizzle with the mock cream cheese frosting (melted vegan white chocolate). Allow chocolate to set before serving. Easy make these flourless cookies nut free, by substituting the peanut butter for a nut-free alternative. Tahini, sunflower seed butter and wow butter are all fantastic options. Omit the nuts of choice and replace with dried fruit or seeds, like pepitas or sunflower seeds. For those with an intolerance to oats or are gluten-free but don’t feel comfortable using gluten-free rolled oats, there are some substitutions which work well. Buckwheat flakes, quinoa flakes, and rice flakes can all be used instead of oats. If you use rice flakes, be sure to add an extra 2 tablespoons to compensate for the light texture. While carrot cake cookies can be stored at room temperature, it isn’t recommended, as they will not stay fresh. Store leftover cookies in the fridge, and refrigerating them will ensure they last for at least 5 days. 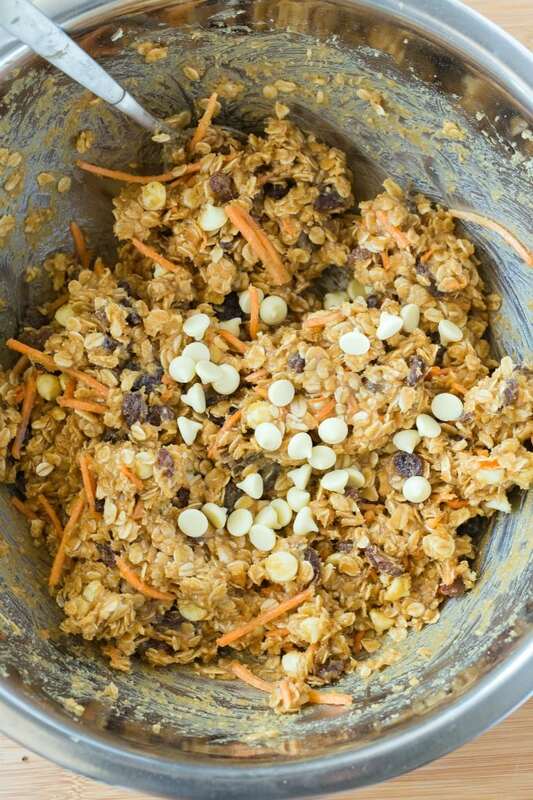 You can freeze carrot oatmeal cookies and this will keep for at least 2 months. Store the frozen cookies in parchment paper, to avoid freezer burns. Thaw pre-frozen cookies in the refrigerator overnight, before consuming the next day. Healthy and easy flourless oatmeal cookies that taste like carrot cake! Made with rolled oats and naturally sweetened, these soft and chewy cookies are made without eggs and without milk, and the perfect vegan and gluten free snack! Preheat the oven to 175C/350F. Line a large baking tray or cookie sheet with parchment paper and set aside. In a large mixing bowl, add your oats, cinnamon, banana, and peanut butter and mix well. Fold in your shredded carrots and dried fruit (or nuts) and mix until fully incorporated. Lightly wet your hands and form 8 small balls of cookie dough. Place the balls of dough on the lined tray and press each into a cookie shape. Bake for 12-15 minutes, or until golden on the edges. Remove from the oven and allow to cool on the tray for 10 minutes, before transferring to a wire rack to cool completely. 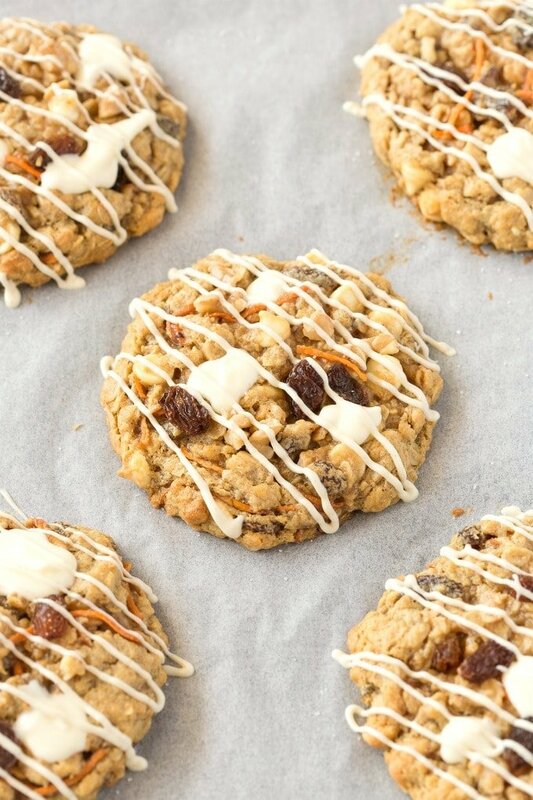 Once cool, drizzle with optional white chocolate chips. 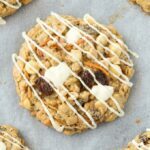 Carrot Cake Oatmeal Cookies (Vegan, Gluten Free) should be kept refrigerated and will keep for up to 1 week. 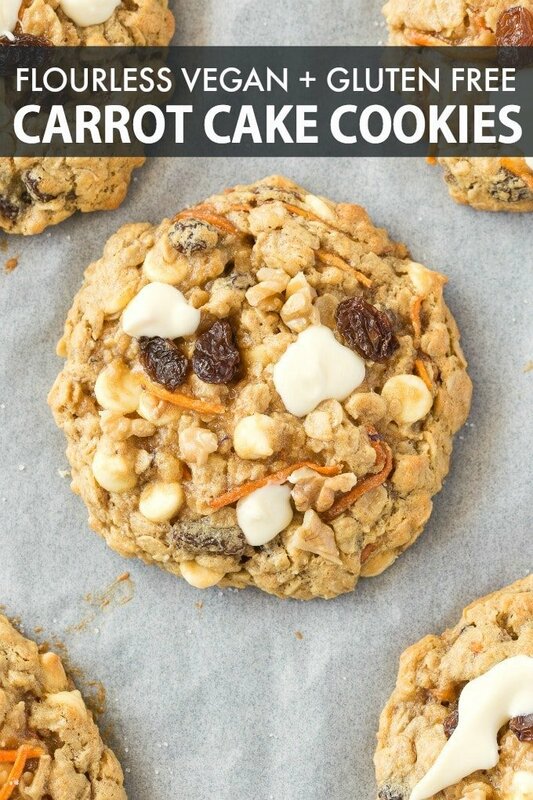 Carrot cake Cookies are freezer friendly and will keep frozen for up to 2 months.